Home to the Serengeti and Ngorongoro Crater. The popular Northern Circuit which includes Lake Manyara, Tarangire, Ngorongoro Crater and it’s neighbour the Serengeti National Park all teaming with wildlife. A safari in the northern circuit will also give you the opportunity to visit the Olduvai Gorge known as “The Cradle of Mankind”, where remains of one of the earliest humans were discovered. The Serengeti National Park is a park in the Serengeti ecosystem in the Mara and Simiyu regions. The name “Serengeti” is an approximation of the word used by the Maasai to describe the area, siringet, which means “the place where the land runs on forever”. The Serengeti gained more fame after the initial work of Bernhard Grzimek and his son Michael in the 1950’s. Together, they produced the book and film Serengeti ‘Shall Not Die’, widely recognized as one of the most important early pieces of nature conservation documentary. The park is famous for its annual migration of over 1.5 million white-bearded wildebeest and 250,000 zebra. The park covers 14,750 km² of grassland plains, savanna, riverine forest and woodlands. The park lies in northwestern Tanzania, bordered to the north by the Kenyan border, where it is continuous with the Maasai Mara National Reserve. To the southeast of the park is the Ngorongoro Conservation Area, to the southwest lies Maswa Game Reserve, to the west are the Ikorongo and Grumeti Game Reserves, and to the northeast and east lies the Loliondo Game Control Area. 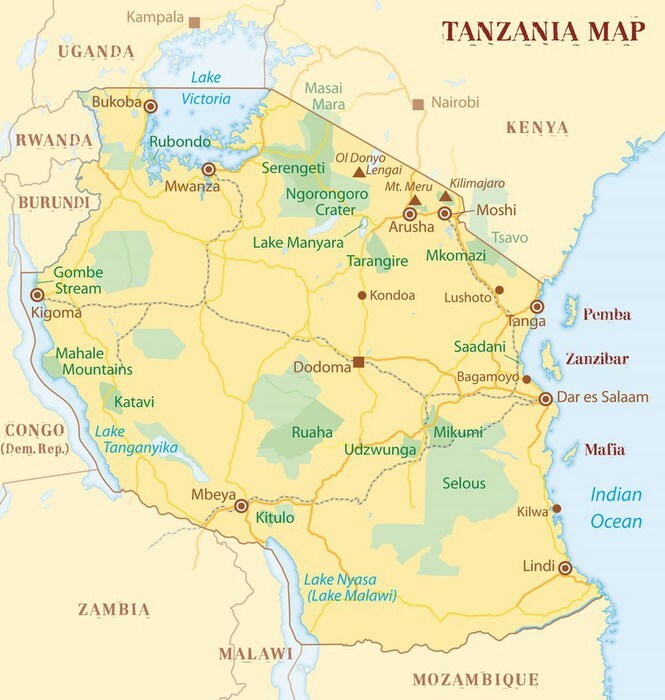 Together, these areas form the larger Serengeti ecosystem. Serengeti plains: the almost treeless grassland of the south is the most emblematic scenery of the park. This is where the wildebeest breed, as they remain in the plains from December to May. Other hoofed animals – zebra, gazelle, impala, hartebeest, topi, buffalo, and waterbuck – also occur in huge numbers during the wet season. “Kopjes” are granite formations that are very common in the region, and they are great observation posts for predators, as well as a refuge for hyrax and pythons. Western corridor: the black clay soil covers the savannah of this region. The Grumeti River and its gallery forests are home to Nile crocodiles, patas monkeys, hippopotamus, and martial eagles. The migration passes through here from May to July. Northern Serengeti: the landscape is dominated by open woodlands (predominantly Commiphora) and hills, ranging from Seronera in the south to the Mara River on the Kenyan border. Apart from the migratory wildebeest and zebra (which occur from July to August, and in November), this is the best place to find elephant, giraffe, and dik dik. The Ngorongoro Conservation Area (NCA) is a protected area and a World Heritage Site located 180 km west of Arusha in the Crater Highlands area of Tanzania. The area is named after Ngorongoro Crater, a large volcanic caldera within the area. Ngorongoro was named by the Maasai as El-Nkoronkoro meaning Gift of Life. This was because they were migrating from Central Africa for a permanent settlement which might explain why the Ngorongoro Conservation Area is mostly occupied by the Maasai. Approximately 25,000 large animals, mostly ungulates, live in the crater. Large animals in the crater include the black rhinoceros, the local population of which declined from about 108 in 1964-66 to between 11-14 in 1995, the African buffalo or Cape buffalo, and the hippopotamus. There also are many other ungulates: wildebeest, Grant’s zebra, the common eland, and Grant’s and Thomson’s gazelles. Waterbucks occur mainly near Lerai Forest. There are no topis, oribis, or crocodiles. Impala are absent because the open woodland they prefer does not exist. Giraffe are also absent. Cheetahs, East African wild dogs and leopards are rarely seen. The closest national park to Arusha town – northern Tanzania’s safari capital – Arusha National Park is a multi-faceted jewel, often overlooked by visitors, despite offering the opportunity to explore a beguiling diversity of habitats within a few hours. The entrance gate leads into shadowy montane forest inhabited by inquisitive blue monkeys and colourful turacos and trogons – the only place on the northern safari circuit where the acrobatic black & white colobus monkey is easily seen. In the midst of the forest stands the spectacular Ngurdoto Crater, whose steep, rocky walls enclose a wide marshy floor dotted with herds of buffalo and warthogs. Further north, rolling grassy hills enclose the tranquil beauty of the Momella Lakes, each one a different hue of green or blue. Their shallows sometimes tinged pink with thousands of flamingos, the lakes support a rich selection of resident and migrant waterfowl, and shaggy waterbucks display their large lyre-shaped horns on the watery fringes. Giraffes glide across the grassy hills, between grazing zebra herds, while pairs of wide-eyed dik dik dart into scrubby bush like overgrown hares on spindly legs. Although elephants are uncommon in Arusha National Park, and lions absent altogether, leopards and spotted hyenas may be seen slinking around in the early morning and late afternoon. It is also at dusk and dawn that the veil of cloud on the eastern horizon is most likely to clear, revealing the majestic snow-capped peaks of Kilimanjaro, only 50km away. But it is Kilimanjaro’s unassuming cousin, Mount Meru – the 5th highest in Africa at 4,566 m – that dominates the park’s horizon. Its peaks and eastern foot slopes protected within the national park, Meru offers unparalleled views of its famous neighbour, while also forming a rewarding hiking destination in its own right. Stretching for 50 km along the base of the rusty-gold 600 m high Rift Valley escarpment, Lake Manyara is a scenic gem, with a setting extolled by Ernest Hemingway as “the loveliest I had seen in Africa”. Contrasting with the intimacy of the forest is the grassy floodplain and its expansive views eastward, across the alkaline lake, to the jagged blue volcanic peaks that rise from the endless Maasai steppes. Large buffalo, wildebeest and zebra herds congregate on these grassy plains, as do giraffes – some so dark in coloration that they appear to be black from a distance. Inland of the floodplain, a narrow belt of acacia woodland is the favoured haunt of Manyara’s legendary tree-climbing lions and impressively tusked elephants. Squadrons of banded mongoose dart between the acacias, while the diminutive Kirk’s dik dik forages in their shade. Pairs of klipspringer are often seen silhouetted on the rocks above a field of searing hot springs that steams and bubbles adjacent to the lakeshore in the far south of the park. Manyara provides the perfect introduction to Tanzania’s birdlife. More than 400 species have been recorded, and even a first-time visitor to Africa might reasonably expect to observe 100 of these in one day. Highlights include thousands of pink-hued flamingos on their perpetual migration, as well as other large water birds such as pelicans, cormorants and storks. Tarangire National Park is the 6th largest national park in Tanzania; it is located in Manyara Region. The name of the park originates from the Tarangire River that crosses the park. The Tarangire River is the primary source of fresh water for wild animals in the Tarangire Ecosystem during the annual dry season. The Tarangire Ecosystem is defined by the long-distance migration of wildebeest and zebras. During the dry season thousands of animals concentrate in Tarangire National Park from the surrounding wet-season dispersal and calving areas. It covers an area of approximately 2,850 km². The landscape is composed of granitic ridges, river valley, and swamps. Vegetation is a mix of acacia woodland, commiphora-combretum woodland, seasonally flooded grassland, and baobab trees. The park is famous for its high density of elephants and baobab trees. Visitors to the park in the June to November dry season can expect to see large herds of thousands of zebra, wildebeest and buffalo. Other common resident animals include waterbuck, giraffe, dik dik, impala, eland, Grant’s gazelle, vervet monkey, banded mongoose, and olive baboon. Predators in Tarangire include lion, leopard, cheetah, caracal, honey badger and African painted wild dog. Home to more than 550 bird species, the park is a haven for bird enthusiasts.